Eye Candy: Visually stimulating Utah poster artists rock the art. Nearly 60 years after the first rock poster was screen-printed to promote newly blossomed rock and roll, Salt Lake City’s own poster artists are pushing the craft in exciting new directions. Rock art reigned supreme in the mid-’60s, used for eclectic concert promotion and LP covers. But with the evolution of music releases into smaller-form 7-inch singles, 8-tracks and cassettes in the ’70s (and later into CDs and digital downloads), cool rock art became an endangered species. The post-punk era of the ’80s brought a re-emergence in screen-printing for gig posters, and the music and art scene in Austin, Texas, served as the catalyst for a screen-printing movement that has spread internationally ever since. Books such as the brick-heavy rock-poster Bible The Art of Modern Rock, published in 2004, included lush images, historical essays and interviews with poster pioneers. That book, its precursor The Art of Rock and GigPosters.com have helped resuscitate this populist art and musical movement. Now, a diverse array of Utah artists—from graphic designers to die-hard screen-printers—are receiving national recognition. 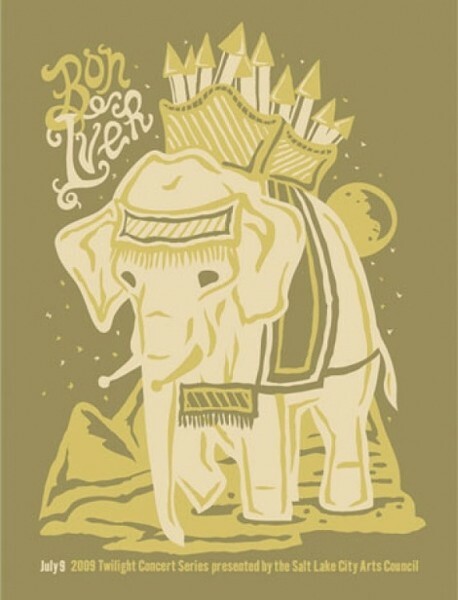 Potter Press owners Nick and Erin Potter began doing posters in 2005 for friends’ bands, including The Curtains and Grizzly Prospector, and the duo has moved on to illustrate mainly national touring acts they like through their collaborative design process. “We’ve worked together for so long, it feels odd to create and complete something without [Erin’s] input,” Nick Potter says. 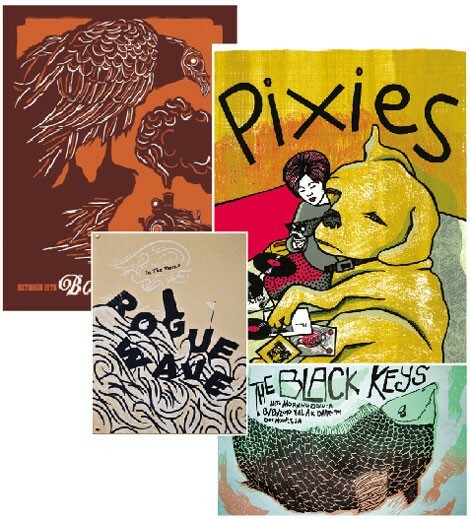 Among the favorite concert posters they’ve made are Explosions in the Sky and The Black Keys. “I don’t think people realize how much work goes into screen-printing, and how difficult it is,” says Spencer Charles of Calamity Industries. The recent design graduate has printed four concert posters since 2008—Rogue Wave, Maps & Atlases, Coco Rosie and Brian Jonestown Massacre. Preferring quality over quantity, he thinks there are too many posters plastered around town. “Slowtrain [Records] and Nobrow [Coffee & Tea Company] do a good job weeding out the crap and presenting the stuff that should be up front,” Charles says. “I’m content to just break even because it’s a creative outlet,” says artist Travis Bone, aka Fur Turtle. “In most projects, I’m given freedom to express myself however I want.” Bone, notably, designs the Twilight Concert Series posters. After sending drawings to various bands, his career launched with Mogwai’s 2004 European tour posters. Leia Bell is possibly Utah’s most well-known poster artist, with work featured on GigPosters.com and in The Art of Modern Rock. During her poster-making heyday, circa 2003, she made more than 60 posters yearly—98 percent of them for Kilby Court. When attending Flatstock 2003—rock poster-art mecca at South by Southwest—her collection sold out. Since then, her career’s shifted toward fine art, and she’s only made one gig poster in 2010, for Weezer, her brother’s band. Looking back, she’s proud of her rock poster background. “It has been an awesome thing to help change people’s perceptions [of SLC’s music scene]” says Bell, who thinks the rock-art community’s emerging artists are nearing ranks with larger musical markets like Seattle, Chicago and Austin.